The International J/24 Class Association has received approval of its proposed rule changes from the ISAF. The new rules will be in effect as of April 14, 2011. The biggest change, which will affect all J/24s, is the 15 kg reduction in the all-up weight for racing. This will not require your boat to be re-weighed, but will only require changes to the Optional and Required Inventory List that should be kept on each boat while racing. If you have a valid IJCA measurement certificate, you will not be required to obtain a new one. The new all-up racing weight for the J/24 is 1330 kg, down from the previous 1345 kg. This means you can now remove some of the items that perhaps are kept on your boat merely to make the all-up weight. Download a copy of the new Optional and Required Inventory List reflecting the 1330 kg minimum weight. - A proposal to allow a wire strap between the mast bearing beam and the underside of the deck was not included in the new IJCA Class Rules. All rule changes require the approval of J/Boats Inc. (the J/24 copyright holder) and the company was unwilling to allow this rule change until the affect on the hull structure could be studied more carefully. The ISAF therefore rejected this rule change proposal. A full list of the changes approved by the ISAF can be downloaded by clicking here. 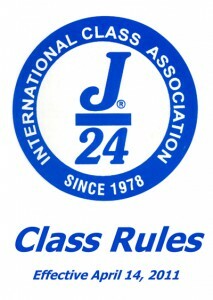 The latest complete version of the J/24 Class Rules can be downloaded by clicking here.